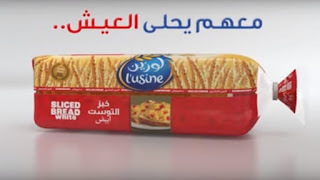 Tarek Chemaly: L'Usine - an epic line for their sliced bread! L'Usine - an epic line for their sliced bread! Well, this must be the best thing since sliced bread (sorry for the pun). L'Usine, which usually sticks to tried and tested formulas of "slice of life" of family ambiance, just packed a wonderful punch for their "Sliced Bread (white)" TVC. Watch the movie here but the real punch comes in the closing tagline: "With them, life becomes beautiful" - but the word "3aysh" in Arabic also means "bread". So the sentence also means "with them, bread is wonderful". The double-entendre is so easy I am amazed no other brand had hijacked it long ago. But as the French say "c'est complique de faire simple" (it is complicated to do something simple).